A team of top boffins believe that they have cracked one of the main problems of interplanetary travel - that of surviving deadly solar radiation storms. The physicists say they have come up with an idea for a crafty forcefield which could stand off the protoplasm-punishing particle squalls of deep space. There's plenty of weather on the sun. Thus far, only a very few people have ever travelled beyond the protection of the Earth's magnetosphere - the Apollo astronauts who went to the Moon in the 1960s and 70s. All other humans in space - including the crews of the present-day International Space Station - have remained within the protective magnetic field of their home planet. The Apollo missions were reasonably safe because they were brief - only days long. 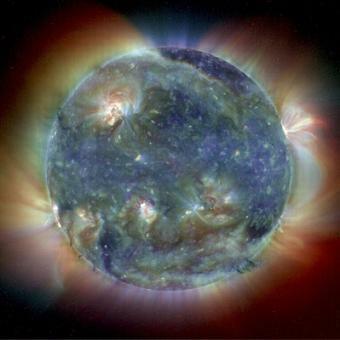 The risk of a major solar radiation storm was minimal. Even so, had there been a serious solar event during an Apollo mission the results might have been disastrous - the more so as there is no lunar atmosphere to protect explorers. A journey to Mars, however, is projected to take 6 months - and then there's the return trip to consider. Even though the astronauts would be protected by the Martian atmosphere (and the planet itself) during their stay, a year in deep space would be very dangerous. Even normal background radiation could be expected to use up much of an astronaut's lifetime exposure limit. A solar storm, more or less bound to occur over such a period, would breach the health guidelines and create an unacceptable risk of cancer. A bad particle squall could cause radiation sickness severe enough to incapacitate or even kill a Mars-ship crew on the spot. But now boffins at the Rutherford Appleton Lab and the Universities of York, Strathclyde and Lisbon have shown that it's possible to generate a "portable magnetosphere" or magnetic forcefield just a few hundred metres across, which would prevent ionised particles reaching a space ship. It had previously been thought that only mighty planetary-scale fields could possibly be effective, but new computer simulations suggest that just a small "hole" in the solar winds could be enough. “These initial experiments have shown promise," said Dr Ruth Bamford of the Rutherford Appleton lab, rather cautiously. Astronauts in a ship moving through space would find a nifty lightweight forcefield especially useful. Ordinary radiation shielding is extremely heavy, but everything in a spaceship must be as light as possible, every kilo of mass being precious. On the other hand the power required to generate a "magnetic bubble" could be an issue. The new research would seem to have implications for NASA's plans to build a permanent Moon base, too. While lunar explorers would gain a good deal of protection from the Moon itself, blocking out half the sky, the lack of any atmosphere would see an explorer caught outside his thick-walled underground moon bunker by a solar storm during daylight in serious trouble. Moon rovers and inflatable habitats of the future might find magno-forcefield kit very handy. Needless to say, reasonably portable forcefields would also be invaluable for the hover tanks, power-armour suits or interplanetary battlecruisers of tomorrow - ideal for resisting deadly particle-cannon blaster beams, krenon rays* etc. *We would vote for the next kind of ray or beam to be called this.